Currey Park is located on Victor Street in Chatswood, just down the road from the local Westfield. In fact, it is right beside the Westfield carpark. The park largely serves as a walkway, but it is also a nice quiet place to relax and has a lot more to it than most passers-by would realise. 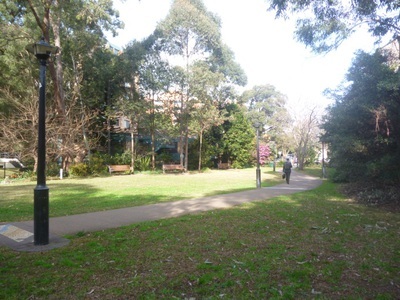 Despite its size, Currey Park is not an insignificant part of Chatswood, being steeped in both Indigenous and European history. It was named after Henry Currey, a Chatswood resident and tin prospector who sold the land to fund his mining ventures at Tingha, a small NSW town that lies south of Inverell. This connection to Tingha is present in the park's unique fountain, which sits in the corner where the path curves around. 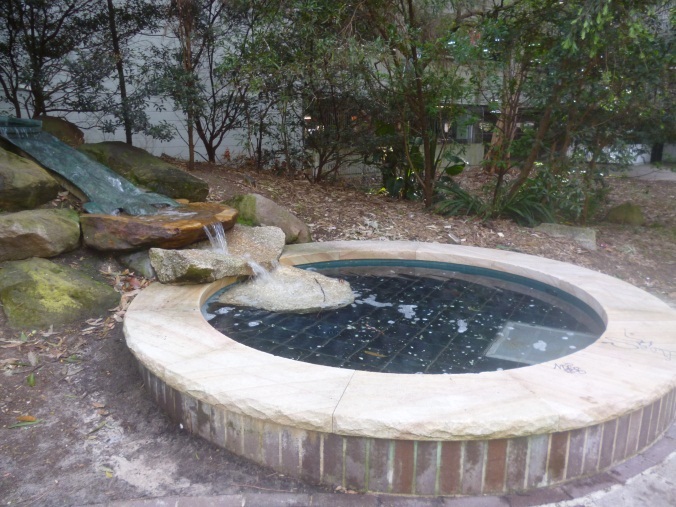 Made of bronze, stone and handmade tiles, the fountain includes a sculpture of Tingha Women (down which the water runs) and was created by artist Joe Hirst. Next to the fountain is a plaque explaining the story of Tingha Woman, who was turned to stone as punishment for running away with a man deemed inappropriate by her tribe. Prior to being turned into a park (opening in 2002) in response to the industrialisation of Chatswood, Currey Park was an orchard, an unpaved Tingha Street and even a carpark. Today, the 4400m² site includes a main path mosaic pavement inlays by Marie Stucci, as well as lights, trees, garden beds, grassy areas and seven park benches. Along with the fountain (and located right beside it) there is one other important feature of Currey Park: the Willoughby - Bingara Friendly City Commemorative Garden. This garden remembers the decade long relationship between the Willoughby and Bingara and is dedicated to the former mayor of Willoughby, John Squire, for the efforts he put into the relationship. It contains plants indigenous to Bingara and Willoughby. The main purpose of Currey Park is to connect Victor Street and Parkside Lane, but there are also entrances from Devonshire Street and the Westfield carpark, which sits alongside the park and is only partially obscured by trees. 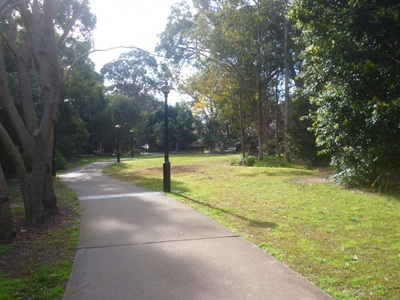 The park is also connected to the Dougherty Community Centre by a pedestrian crossing on Victor Street, and the much larger Chatswood Park can be reached via a pathway through the centre. Being so small, Currey Park is not the best park in Chatswood to take your kids or have a picnic, but it is a great place to have lunch if you work in the the area. And if you are one of the people that frequently uses it as a walkway, make sure on your next trip you stop to appreciate the richness of your surroundings. Why? Appreciate the richness of what most would see as a mere walkway.